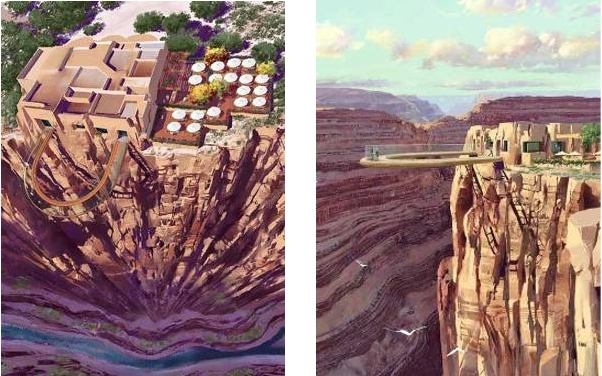 The Grand Canyon's Skywalk is a "U" shaped, cantilevered bridge, suspended 4,000 ft above the Colorado River and extending 70 ft from the canyon's rim. Four layers of Saint-Gobain Diamant low iron glass with DuPont SentryGlas interlayer comprise the 10' 2" deck. The railings, made with the same glass, stand 5' 2" tall. Skywalk is designed for a total load equal to the weight of 71 Boeing 747 airplanes (more than 71 million pounds). In addition, the bridge is built to sustain 100 mile per hour winds, from 8 different directions, and an 8.0 magnitude earthquake, within 50 miles. Skywalk is owned and operated by the Hualapai Tribe.